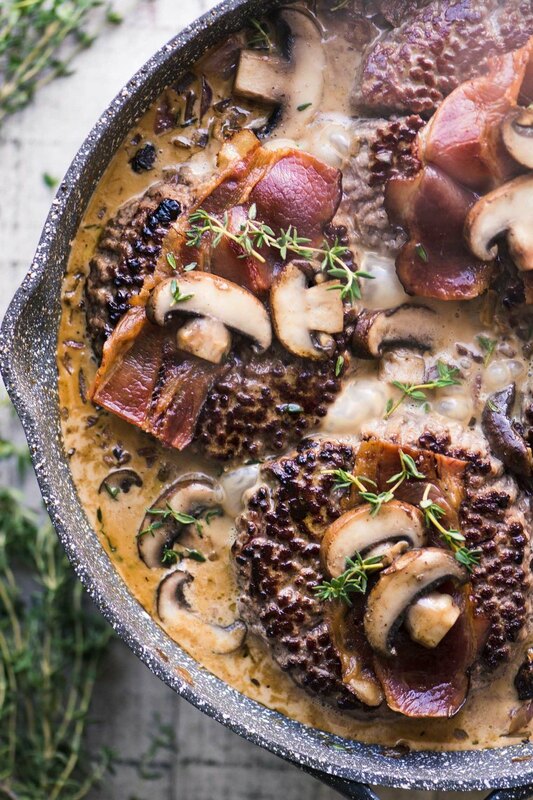 Chopped Steak with Bacon and Mushroom Gravy ~ a cozy and comforting supper with a Scandinavian vibe perfect for hunkering down on a chilly night. Heat the cream to a simmer and then add the dried mushrooms. Stir to cover them with cream, and let sit for 30 minutes. I like to cover with plastic to keep the heat in. Cook the bacon until crisp and place on paper towels. Give the bacon a rough chop, reserving 4 pieces for topping your burgers. Drain off all but 2 Tbsp of grease from the pan and reheat on medium high heat. Brown the burgers well on both sides. You won't be cooking them through at this stage, but be sure to get some good color on them. Remove to a plate and cover to keep warm. Add a pat of butter and a tablespoon of oil to the pan and saute the fresh mushrooms, onions, and garlic for several minutes until the onions have softened and the mushrooms start to brown. Add the broth and be sure to scrape up any browned bits from the pan. Add the Worcestershire sauce, thyme, and the soaked wild mushrooms and their cream. Season to taste with salt and pepper and bring up to a simmer. Nestle the burgers back into the sauce, turn down the heat, and cook until the burgers are done through. I like to cover the pan to keep in the liquid. Garnish each burger with a piece of bacon and a couple of mushroom slices. Serve with boiled buttered potatoes.